Herman Ehrhardt was born in Diersburg, Germany, on 29th November, 1881. During the First World War Ehrhardt was a commander in the German Navy. After the war, former senior officers in the German armed forces began raising private armies called Freikorps. 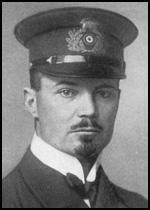 Captain Kurt von Schleicher, of the political department at the army, secretly equipped and paid for the Freikorps. As Louis L. Snyder has pointed out: "Composed of former officers, demobilized soldiers, military adventurers, fanatical nationalists, and unemployed youths, was organized by Captain Kurt von Schleicher. Rightist in political philosophy, blaming Social Democrats and Jews for Germany's plight, the Freikorps called for the elimination of traitors to the Fatherland." Ehrhardt was one of those who joined the Freikorps. On 7th November, 1918, Kurt Eisner made a speech where he declared Bavaria a Socialist Republic. Eisner made it clear that this revolution was different from the Bolshevik Revolution in Russia and announced that all private property would be protected by the new government. Eisner explained that his program would be based on democracy, pacifism and anti-militarism. The King of Bavaria, Ludwig III, decided to abdicate and Bavaria was declared a republic. Eisner had the support of the 6,000 workers of the munitions factory in Munich that was owned by Gustav Krupp. Many of them had come from northern Germany and were much more radical than those of Bavaria. The city was also a staging post for troops withdrawing from the Western Front. It is estimated that the majority of the 50,000 soldiers also supported Eisner's revolution. The anarcho-communist poet, Erich Mühsam, and the left-wing playwright, Ernst Toller, were other important figures in the rebellion. At the beginning of January, 1919, Friedrich Ebert, Germany's new chancellor, ordered the removal of Emil Eichhorn, the head of the Police Department in Berlin. As Rosa Levine pointed out: "A member of the Independent Socialist Party and a close friend of the late August Bebel, he enjoyed great popularity among revolutionary workers of all shades for his personal integrity and genuine devotion to the working class. His position was regarded as a bulwark against counter-revolutionary conspiracy and was a thorn in the flesh of the reactionary forces." Chris Harman, the author of The Lost Revolution (1982), has argued: "The Berlin workers greeted the news that Eichhorn had been dismissed with a huge wave of anger. They felt he was being dismissed for siding with them against the attacks of right wing officers and employers. Eichhorn responded by refusing to vacate police headquarters. He insisted that he had been appointed by the Berlin working class and could only be removed by them. He would accept a decision of the Berlin Executive of the Workers' and Soldiers' Councils, but no other." Friedrich Ebert called in the German Army and the Freikorps to bring an end to the rebellion. 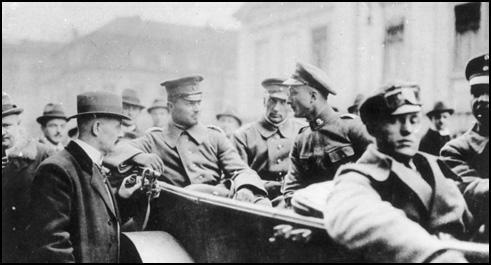 Captain Hermann Ehrhardt took his group of Freikorps to Munich. By 13th January, 1919 the rebellion had been crushed and most of its leaders were arrested. This included Rosa Luxemburg, Karl Liebknecht and Wilhelm Pieck on 16th January. Luxemburg and Liebknecht were murdered while in police custody. The journalist, Morgan Philips Price, claimed that they were murdered by the Freikorps. In March 1920, according to the terms of the Treaty of Versailles, the Germans were obliged to dismiss between 50,000 and 60,000 men from the armed forces. Among the units to be disbanded was a naval brigade commanded by Captain Herman Ehrhardt. On the evening of 12th March, 1920, the Ehrhardt brigade went into action. He marched 5,000 of his men twelve miles from their military barracks to Berlin. The Minister of Defence, Gustav Noske, had only 2,000 men to oppose the rebels. However, the leaders of the German Army refused to put down the rebellion. General Hans von Seeckt informed him "Reichswehr does not fire on Reichswehr." Noske contacted the police and security officers but they had joined the coup themselves. He commented: "Everyone has deserted me. Nothing remains but suicide." However, Noske did not kill himself and instead fled to Dresden with Friedrich Ebert. However, the local military commander, General George Maercker refused to protect them and they were forced to travel to Stuttgart. Hermann Ehrhardt entering Berlin on 12th March 1920. Captain Herman Ehrhardt met no resistance as they took over the ministries and proclaimed a new government headed by Wolfgang Kapp, a right-wing politician. Berlin had been seized from the German Social Democrat government. However, the trade union leaders refused to accept the Kapp Putsch and Carl Legien called for a general strike to take place. As Chris Harman, the author of The Lost Revolution (1982), has pointed out: "The appeal had an immediate impact. It went out at 11am on the day of the coup, Saturday 13 March. By midday the strike had already started. Its effects could be felt everywhere in the capital within 24 hours, despite it being a Sunday. There were no trains running, no electricity and no gas. Kapp issued a decree threatening to shoot strikers. It had no effect. By the Monday the strike was spreading throughout the country - the Ruhr, Saxony, Hamburg, Bremen, Bavaria, the industrial villages of Thuringia, even to the landed estates of rural Prussia." Louis L. Snyder has argued: "The strike was effective because without water, gas, electricity, and transportation, Berlin was paralyzed." A member of the German Communist Party (KPD) argued: "The middle-ranking railway, post, prison and judicial employees are not Communist and they will not quickly become so. But for the first time they fought on the side of the working class." Five days after the putsch began, Wolfgang Kapp announced his resignation and fled to Sweden. Ehrhardt also left Germany but later returned. Ehrhardt later form the Viking League, an auxiliary police in Bavaria under Gustav von Kahr. Adolf Hitler saw Ehrhardt as a potential rival and refused to invite him to join the Beer Hall Putsch in November, 1923. He was told that Hitler intended to gain his revenge during the Night of the Long Knives. He therefore was therefore forced to flee to Austria. Herman Ehrhardt died on 27th September 1971.